Posted on April 7, 2010	by Lou Murray, Ph.D.
Once again, I’m doing Harvest Monday late. I went to Los Angeles yesterday with a friend to see the Renoir exhibit at the LACMA. We had a great time, but it didn’t give me time to post my weekly harvest. I got a new rain gauge so I can keep track of what little rain we get here in southern California. Yesterday’s storm brought us a mere 0.15 inches of rain. That’s it for the week. But my rain barrels collect rain off the roof, which collects from a broad area. I was able to save many gallons of rainwater with even this little storm. 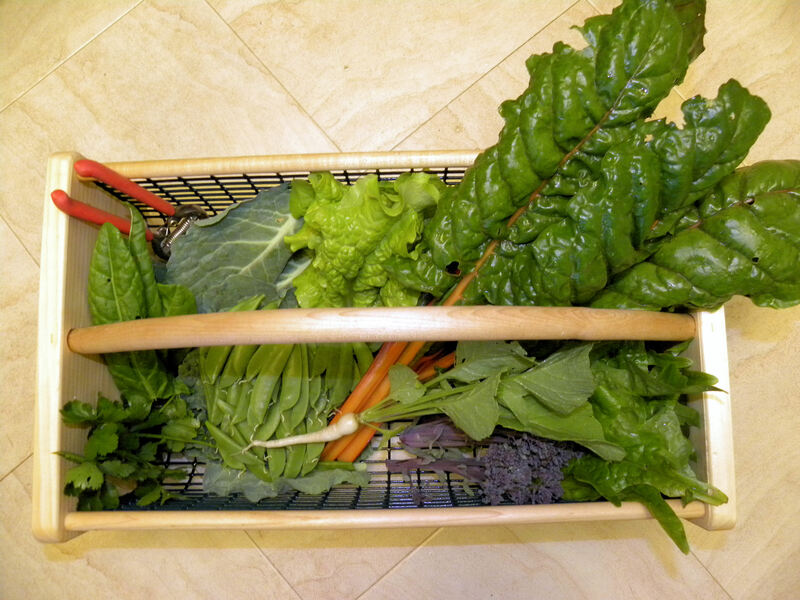 The harvest this week included chard, snap peas, cabbage leaves, purple broccoli, radishes and loads of lettuce. Before I get to the specifics of this week’s harvest, let me catch you up with spring in our garden. The ginger has FINALLY poked its head above ground. The rhubarb has come up. 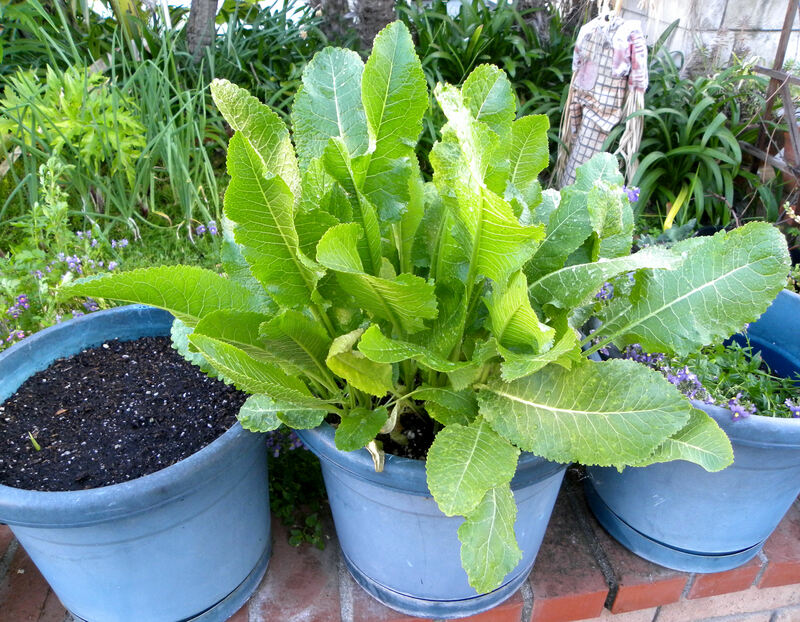 Growth on the horseradish in the center pot is rampant. Ginger in the pot on the left has just poked the first sprouts above ground. All three ginger roots have now sent up a plant shoot. 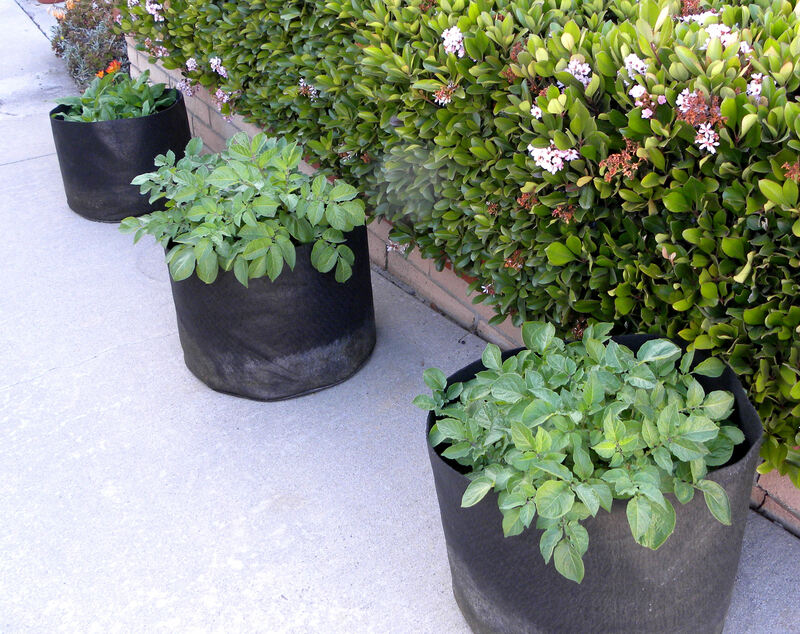 The blue potatoes in the first two Smart Pots are doing well, as are the sunchokes in the back left. 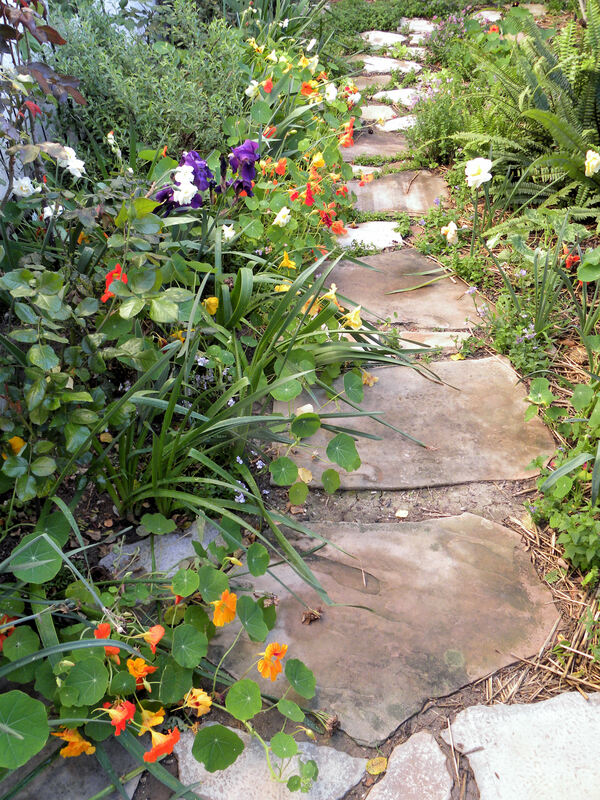 The stone path in back is beautiful this year with nasturtiums, irises, narcissus, roses, allysum, Nemesia and pansies. The beautiful Mt. Hood daffodils have finished blooming in front, but the pink cobbity daisies, orange Kaffir lilies, and camelias are blooming nicely. And the Super Sugar Snap Peas that ate Los Angeles are now a whopping 8 ft tall. Given that they’re in a raised bed, that means that I can no longer reach the peas to harvest them. I have no intention of pruning them. I’m thrilled that something in my garden grows so nicely. 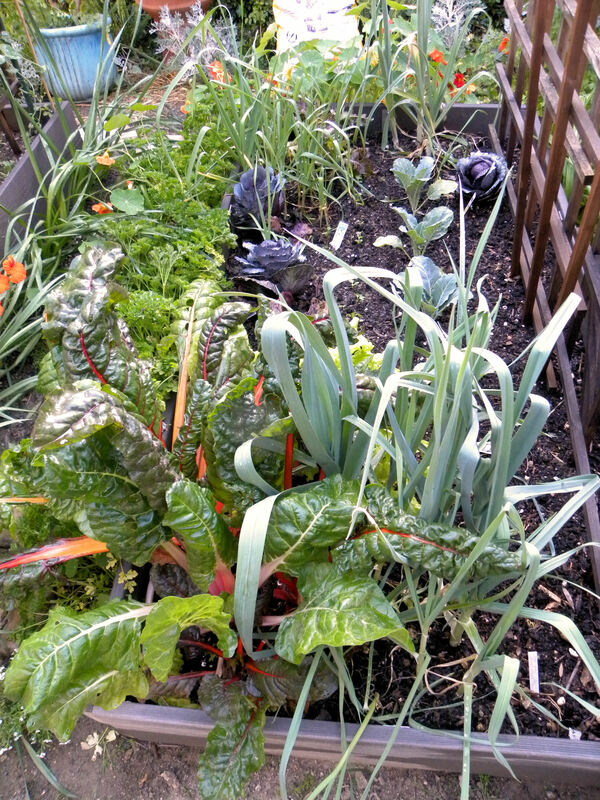 Raised bed #2 has chard, lettuce and leeks ready to harvest, plus garlic, red cabbage, white cauliflower, radishes, and Snow Wind Peas coming along. 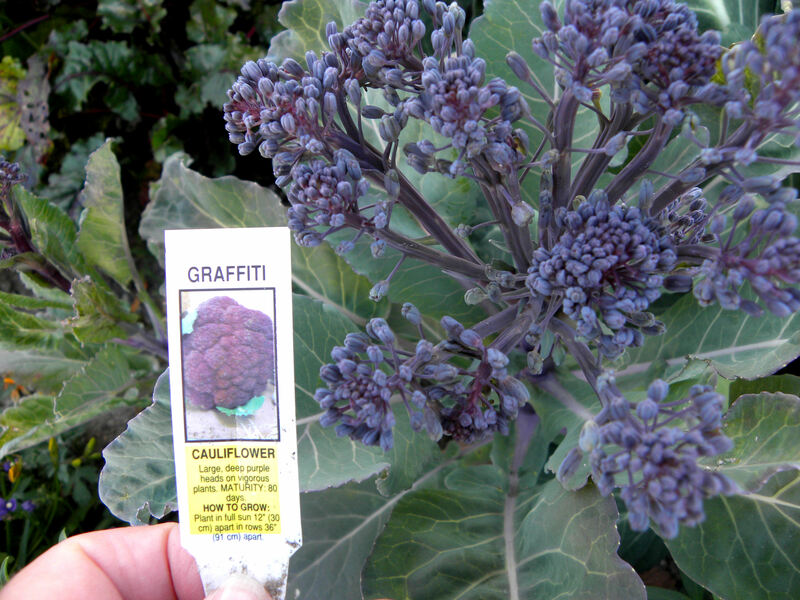 I thought I was growing purple cauliflower, given that the tag on the transplants said "cauliflower," but it is clearly broccoli. No matter, it tasted fine in a stirfry. 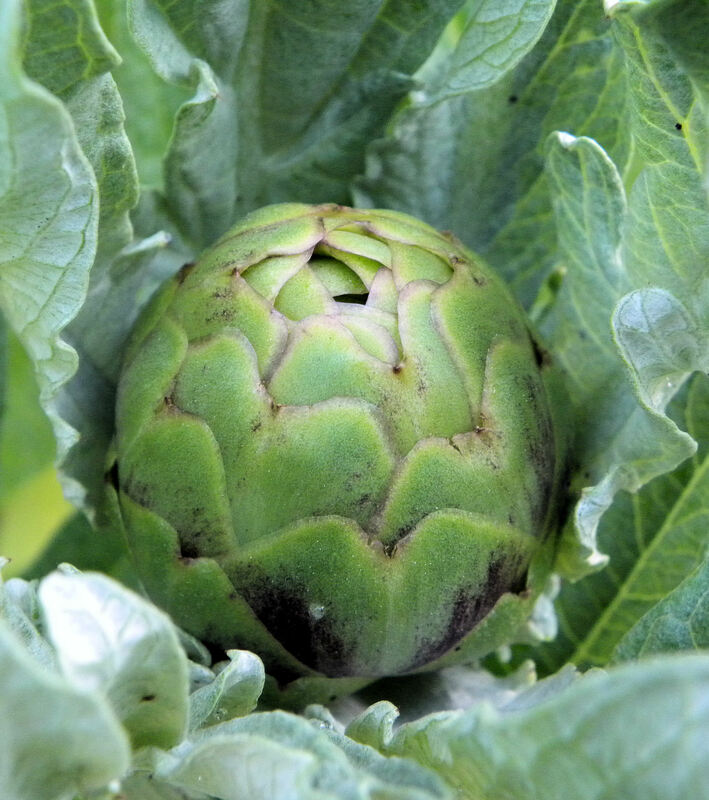 The first artichoke has formed and is growing. I wonder how many artichokes my eight plants will give me this spring. These strawberries have now turned red and are ready to pick today. How exciting. 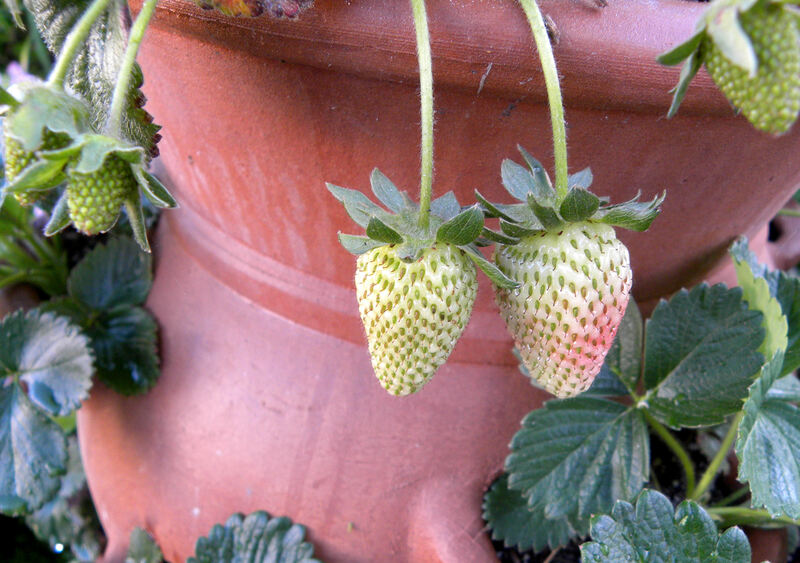 My first strawberries from a strawberry pot. It's working very well, with the promise of a small but ongoing harvest for some time to come. I had to share a photo of this egg with you. 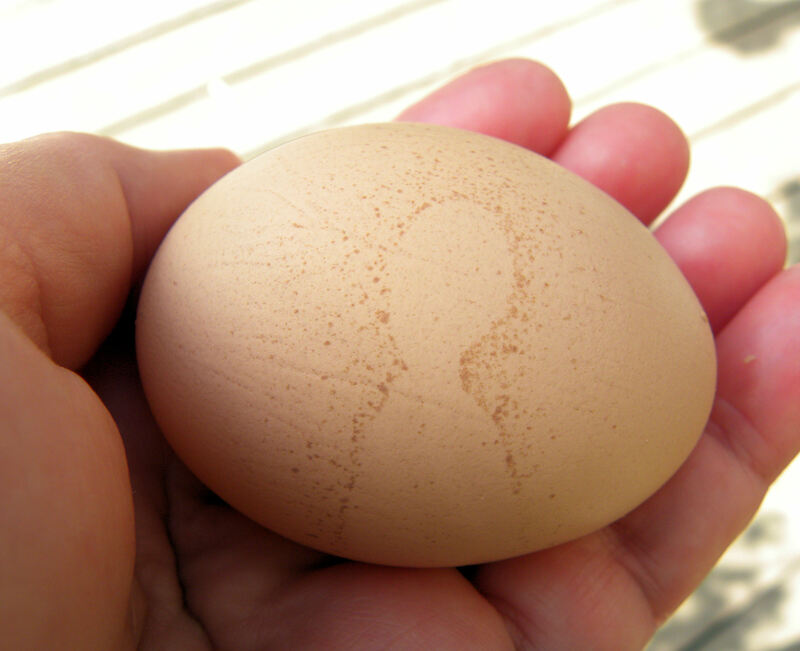 Henny Penny always deposits a pattern on her eggs. This one looked like, well, since it was laid the day before Easter, I call it a risen Christ egg. We ate it for a Seder dinner that we attended at a friend's house. And with that lovely jumbo egg, I’ll get on to the harvest from last week. To see what other’s are harvesting this week, or to add your own, visit Harvest Monday at Daphne’s Dandelions. This entry was posted in Uncategorized and tagged flowers, Harvest Monday, photos, vegetable garden. Bookmark the permalink. I can’t wait for my sugar snap peas. I love them so much. Eight feet tall would be too much for me. Last year I trimmed mine to 6′ so I could reach them. They sent out side shoots once I did and gave me more peas. Aha. Thanks for the tip, Daphne. I didn’t know they’d send out side shoots. I thought that topping them would kill them. Still, I’m curious how high they’ll get. I’m just gonna let them be and use a stepstool to pick peas. 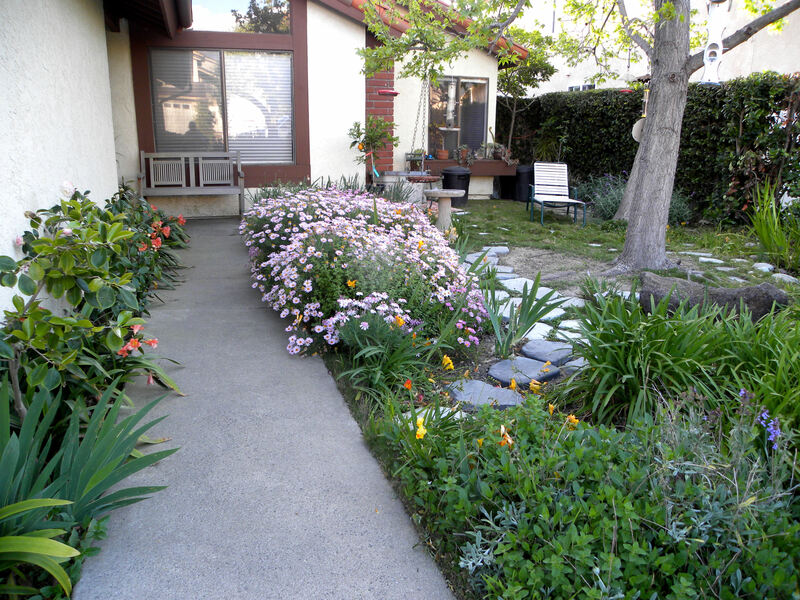 Garden envy, everything is growing so nice in SoCal year round. I’m jumping on the grow potatoes band wagon this year and see how it works out for us. That is purple Sicily cauliflower. It bolted on you. If you cut it and it produced side shoots/ florets then its broccoli and I stand corrected. Happy gardening !! !